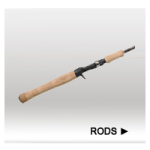 AIRD X is made from a high quality graphite material that gives the rod its sensitivity and strength. Combined with “Braiding-X” construction which reinforces the blank and reduces blank twist. Made from high Quality Graphite material Combined with “Braiding-X” construction reinforcing blanks and reducing unnecessary blank twists Aluminum Oxide Ring guides Split Grip design with EVA foam Hook Keeper Limited 1 Year Warranty Power- H Action- F Length Feet- 7' Pieces- 1 .. The handsome Procyon Freshwater Fishing Rod collection is reasonably priced yet loaded with high-end features. The handles are comfortable, secure and smart in appearance, finely crafted from Cork. The Titanium Oxide Guides are sleek yet rugged and designed to handle the extra stresses of braid. The blanks are constructed from 24 Ton High Modulus Carbon assuring a sensitive rod with backbone to move fish. The many choices of lengths, actions and line class ratings provide a wide array of tools..